By having everyone in your family stay at Large Cabin Rentals for your reunion, you can actually save a huge amount of money! After all, have you considered how much it would cost for everyone attending your reunion to book separate hotel rooms? Check out our handy savings calculator to see exactly how much you can save at our private cabins compared to a standard hotel room. We are sure that you will be pleasantly surprised by the results! Stay with Large Cabin Rentals and your reunion will become more affordable for your entire family. This also means that there will be more money in the budget for attractions, dining out, shopping and other fun activities! When getting a large group together for a reunion, we know it can be tough to keep everyone in your family entertained. After all, there may be all age groups in your family ranging from young children to grandparents! The great news is that the cabins from Large Cabin Rentals has a wide variety of incredible amenities for everyone in the family to enjoy! 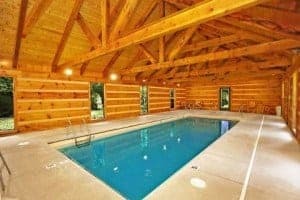 Reserve one of our cabins with an indoor heated pool and have a blast splashing around with the kids or book a cabin with a home theater room where you can watch everything from the latest sporting events to the biggest Hollywood blockbusters! From miniature golf courses and Jacuzzi tubs to fireplaces and game rooms, the amenities at our Smoky Mountain cabins for large groups are sure to be a highlight of your family reunion! One of the top things that families love to do when seeing each other again during a reunion is to share meal times together! Our large cabin rentals in the Smokies feature modern kitchens with every amenity imaginable to prepare a delicious meal for your family. The only thing you need to bring is some groceries, which you can bring from home or pick up at our local stores such as Kroger, Publix and Walmart. Getting everyone together for a meal has never been more convenient as you can simply gather in your cabin’s huge dining room for breakfast, lunch or dinner. There is plenty of room available to store any leftovers so don’t worry about making too much food! Check out all of our Smoky Mountain cabins for large groups today to plan your family reunion in the Smokies! We look forward to seeing you and your family soon at Large Cabin Rentals! Plan Your Visit Now to Experience the Beautiful Fall Colors in the Smoky Mountains!Get Ready to Rev Your Engines as the Shades of the Past Rod Run Roars into Town! Here is Everything You Need to Know about the Event!